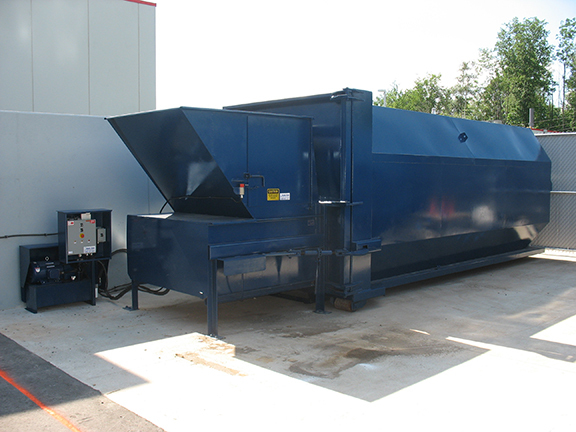 Stationary Compactor | AC Waste Services Inc. Heavy recycling and industrial applications when large masses of bulky and dry products are being created. Low feed height of 43’’. Each compactor can be made differently and designed to meet your specific needs with a large amount of options and a variety of load chamber sizes to fit material of all sizes. Compaction ram dwells against the load with 14’’-18’’ ram penetration, which is more than most competitive models by 100%. The strongest products are easily destroyed due to over 18 tons of compaction. Compactors can be loaded from front, rear or side. Compactor is functional with an array of electrical voltages.